The T-47 was an atmospheric vehicle designed for industrial cargo handling (?). Its cockpit featured positions for a forward-facing pilot and a rear-facing cargo manager. The cargo manager used the airspeeder's magnetic harpoon and tow cable to control repulsorlift cargo modules. The T-47 was heavily modified by the Rebel Alliance for use on the Ice Planet of Hoth. Updates included heaters (naturally), armor plate, weaponry (two heavy blasters) and more powerful engines to accommodate all the extra weight. The Snowspeeders ineffectively defended the Rebel Base and shield generators against an Imperial Assault Force of AT-AT Assault Walkers and AS-AT Scout Walkers of Darth Vader’s elite 501st Legion. One would think that the two big blasters would be more effective than the magnetic harpoon gun, but apparently not. The Snowspeeders made their only appearance in movie The Empire Strikes Back and referenced various times in the Star Wars Universe (except in the Robot Chicken Star Wars specials) as they were adapted to other environments including Swamps and Jungles. Fine Molds has certainly done in the past as they’ve used the actual Lucasfilm Movie Models as the basis for their kits. This one is no different. Major obvious difference from the MPC kit is that the Rebel crewmembers are the correct scale and look like folks from the movie. 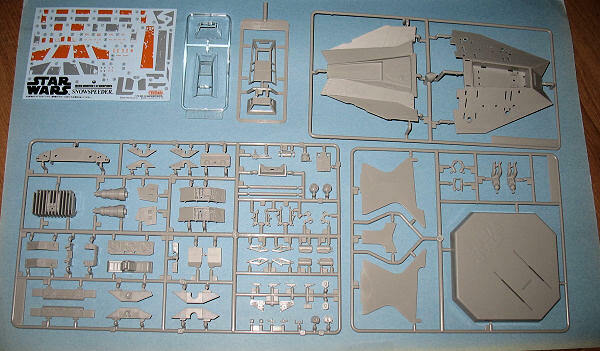 It consists of 74 very detailed parts with no flash and very fine detail. The instructions are mostly in Japanese, but do use English for the paint callouts instead of forcing non Japanese readers to thumb through their Gunze tables to find out which colors are which. Only mild complaint I have is the slightly pebbly surface which I suspect won’t be a problem when I paint it. 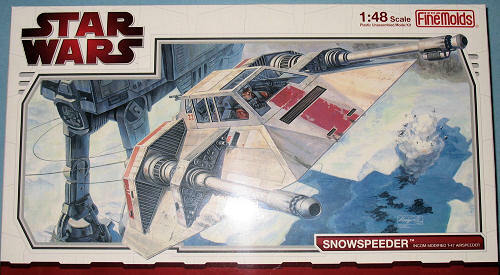 The Fine Molds Snowspeeder looks like one to me which is all that counts. Based on my past experience with previous Fine Molds kits, this kit should be an enjoyable and simple build.